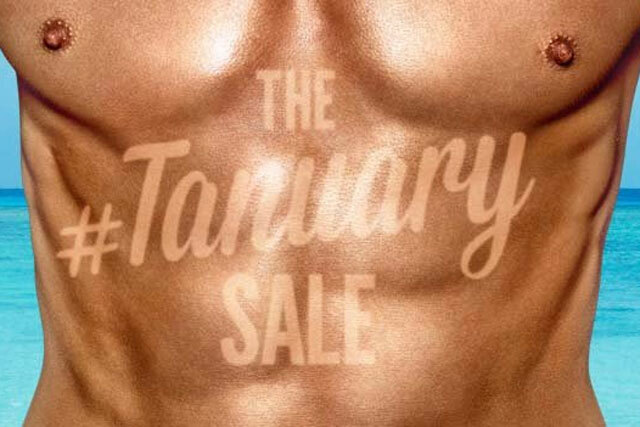 Virgin Holidays' #Tanuary sale ad has been criticised by skin cancer campaigners for featuring "sickening" and irresponsible images of extreme tan lines on holidaymakers. A series of posters created by M&C Saatchi launched this month to promote the Virgin Holidays January sale. They show pictures of bodies with dramatic tan lines, including a man with a wedding ring shaped line, a woman with a snorkel line on her face and a man with a mark shaped like binoculars on his bronzed chest. Gillian Nuttall, the chief executive of skin cancer patient support group Melanoma UK, said: "Of course [the ads] are done with spray tans, but the reality is that when someone does have a tan mark that looks like that, they have lain in the sun from dawn till dusk. How can that be promoting responsible tanning? "Recommendations are [to] stay out of the midday sun and use high factor sun screens, long sleeves, avoid burning. The campaign shows the exact opposite." Virgin Holidays has teamed up with the skin cancer charity Skcin to promote safe tanning as part of the campaign. A "please tan responsibly" message appears on its website and with the terms and conditions on most ads, but some have appeared online without the safety message. Nuttall dismissed the charity partnership as "a tick box exercise in CSR and perhaps another way of attempting to increase sales". She said: "I know the guys at Skcin and I am surprised at them. Their message is prevention, and then they partner with a company that is using photographs depicting sunburns and tanlines in their advertising. For Virgin to pay lip service to sun safety is laughable. "Melanoma is a brutal illness. If you become a late-stage patient, your chances of survival are not great. One bad episode of sunburn can be all it takes to trigger melanoma, and it is disproportionately high in young people [who are likely to be] Virgin’s customers." Virgin Holidays has created a microsite called Tanningaware.co.uk with tips on sun safety. Its partnership with Skcin also includes sun safety training for retail and resort staff and the distribution of 10,000 safe sun information booklets across its retail network. @louiseridley @mcsaatchilondon Tacking to a charity to promote #irresponsible behaviour doesn't make it ok. May as well rerun Rockstar ad! A spokesman for Virgin Holidays said: "Virgin Holidays is the first and only mainstream UK holiday company to proactively promote to customers how to be safer in the sun. "People booking their annual holiday at this time of year will be looking to travel to many hot destinations where it’s likely they will be exposed to the direct sunlight or actively seek a tan. "If that’s their intention we want them to take the necessary precautions and so we partnered with the safer sun awareness charity Skcin to promote that message as proactively and accurately as possible."